The introduction of the two new track and stem formats - with height channels - 7.0.2 and 7.1.2 in Pro Tools 12.8HD to support Dolby Atmos integration will require new versions of plug-ins as well as opportunities for plug-in developers to create new plug-ins to help with immersive sound workflows in Pro Tools. We understand that there are no plug-in updates to support 7.1.2 paths at this time. It would be pretty unusual to need to put a single plug-in across a full 7.1.2 bed, but if you need to, then use plug-ins in Multi-mono mode. Alternatively, treat the stems separately before bringing them together as a 7.1.2 stem. All plug-in developers will need to create new versions of their plug-ins if they want to support the new Dolby Atmos track formats. We understand that 3rd party developers have now received the appropriate AAX software development kits to facilitate them developing compatible plug-ins. We have been talking to a number of plug-in developers like Exponential Audio, Nugen Audio and The Cargo Cult about their thoughts and plans to support the new 7.0.2 and 7.1.2 formats. MC: Exponential Audio's current generation of surround reverbs have been providing reverb for Atmos productions for 3 years now. PTE: You can read more about this in our story from 2014 - Exponential Audio Release New Version Of Surround Plug-ins With 3D Linking. MC: We support other 3D formats as well. Exponential Audio's 3Dlink technology allows for as many as 7 height channels over a 7.1 reverb on the main level. That reverb technology is fully compatible with Pro Tools 12.8HD as well as most other high-end workstations. We welcome Avid's venture into Atmos and hope that the 7.1.2 bed is just the beginning. We're hard at work combining the best of our current and future technologies and look forward to sharing more information as the year goes along. PTE: Michael whilst we are talking about immersive sound plug-ins, what is your view on the number of height channels? MC: I've long felt that two height channels really aren't sufficient for a convincing reverberator. There's no decorrelation between signals in the top front, top sides and top rear. For this reason, my recommendation has always been that at least four height channels are necessary -one for each top corner. Six (by adding a pair of top-side channels) are even better. Reflections and other time cues will propagate much more naturally through the room, and the problem of 'sweet spots' is further minimised. This approach requires that four (or six) objects be created for those reverb outputs and perpetually pinned to those locations in the theatre. In a very large production, the various mixers will have to work out the object allocation (there's a large but finite count of objects) and reverb doesn't always win that battle. If the high pair is all we get, then that's what we work with. But more height channels will give a much more convincing sense of space. My own preferred layout for reverb is 6 or 7 down and 6 up. Reverb over the LFE channel doesn't do anyone any good. Reverb in the centre/dialogue channel must be used very carefully and may best be used to match ADR reverb to location sound. It presents a real danger of making a mix muddy and is often excluded or minimised in Foley, score and FX. PTE: Thank you, Michael, for your insight into reverb and working in immersive sound. Nugen Audio has already shown a beta 7.1.2 capable version of their Halo Upmix plug-in at AES Berlin and NAB in Las Vegas and Avid demonstrated the Halo Upmix plug-in on their dedicated Dolby Atmos stand at NAB 2017 as well. Check out our video overview from the NAB 2017 trade show floor. PT: We already have a beta version of Halo Upmix, which works with the new 7.1.2 track stem format in ProTools (which was on demo at NAB and AES Berlin) - but that was built with a pre-release version of the AAX library that wasn't validated for public release. We have the official release of the AAX library now and should be releasing an update of Halo Upmix which supports the new track format in early July. This update will also provide first order Ambisonic output. PTE: Ambisonics support too, that will be great news for those working in VR. What about your other plug-ins, when do you expect to be able to release new versions of these? PT: For our other plug-ins, they will need to be rebuilt against the new AAX library to support the new format and that is currently scheduled to happen in the third quarter of 2017. JW: Spanner 3 will support 7.0.2 and 7.1.2 for both input and output, in addition to the various formats it already supports. So we expect Spanner will play an important role in the transition to these new formats, allowing people to easily convert to and from the wider stem-widths. As well as the additional stem-width variants (there are now 297 plug-ins in that one bundle!) Spanner has had a significant rebuild, improving the UI, ergonomics and sound quality. 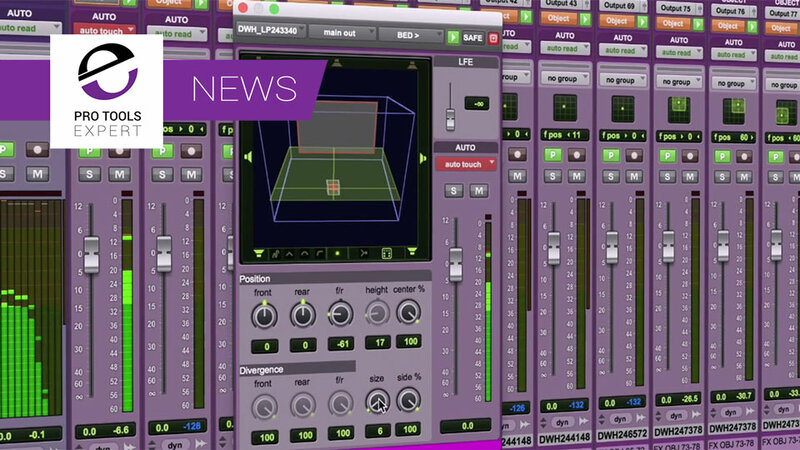 PTE: Do you have any other plug-in developments you can share with the Pro Tools Expert community? Slapper will get support for 7.0.2 and 7.1.2 in the near future but it won’t be available till after the other two. For the meantime, Slapper users can simply insert a Spanner 3 after their 7.1 delay and choose a couple of taps to move into the ceiling channels. As we get more information and announcements about plug-ins supporting the 7.0.2 and 7.1.2 track formats we will update this story as we are doing with our popular Mac OS 10.12 Sierra - Pro Audio Compatibility Update, so bookmark this page and check it regularly if you are working in immersive audio workflows.